My daily schedule is unpredictable. One day, I have enough time to read books, blog and cook. Another day, I crash without flossing. So it is only to be expected that I do not get time to clean my brushes every day, as I would like. Or even remove my makeup properly. Both of which cause breakouts. Sometimes, there simply isn't time to reach for micellar water, cotton pads and a foaming cleanser. All I want is to jump in the shower - where I use Neutrogena Oil-Free Acne Wash or some similar face wash with the Foreo Luna - and crash afterwards. But showering without removing makeup properly causes racoon eyes, foundation marks on my towel and an oily feeling afterwards. Recently I had a breakout phase after not removing my makeup properly on December 4. Decent quality cleansing wipes, followed by a shower, are my go-to method for makeup removal on those busy evenings. Even so, most cleansing wipes don't wipe out eye makeup, and themselves contribute to breakouts. 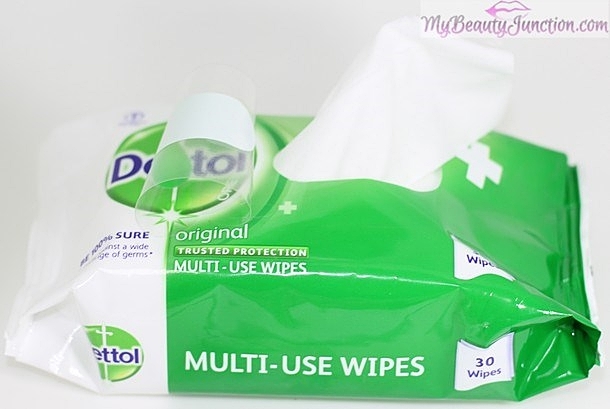 It is important that the wipes remove germs as well as makeup from both my brushes - just to keep them bacteria-free until I can spare the time to clean them properly - as well as my face, as the face- and skin-safe Dettol Multi-Use Wipes do. 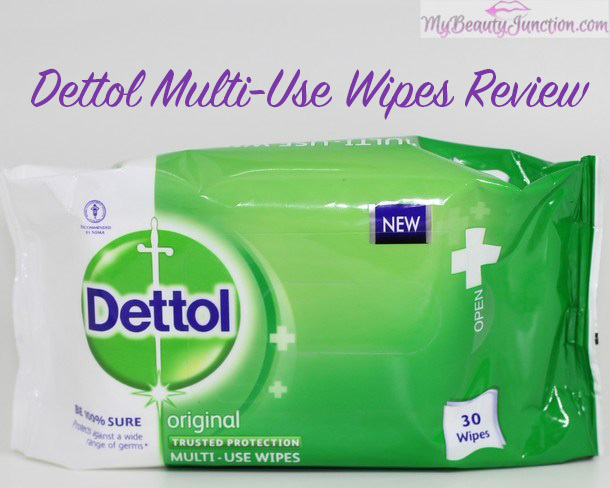 Read on for my review of the Dettol Multi-Use Wipes and to know how I use them in my beauty regimen. Dettol is a household name in many countries. I love their hand sanitisers, which are a staple in my handbag and desk, and sometimes add a capful of Dettol to my bath water and rinse my hair with a very dilute mixture in 500ml water - it helps clear up any flakes from the scalp. Dettol Multi-Use Wipes are face-friendly, pH neutral wipes which keep the skin and any surface where you use them, germ-free. The fragrance is very mild. Because they are pH neutral, the wipes do not harm the skin or strip it of moisture. The wipes are alcohol-free, which means they will not dry out the skin. They also contain emollients which protect the skin. While I was worried that these would be a tad too harsh on my sensitive skin, I have not had any issues so far. The anti-bacterial properties of the wipes have actually helped reduce my breakouts from December 4! These are multi-use wipes. They keep my vanity and mirror germ-free - and I am a spill-prone person - and remove powder fallout easily. I tried them for makeup removal after reading that they were gentle on the skin, and because "surfaces" came last in their list of uses - see the photo above. They feel soft and flexible and not scratchy on the skin. They can be used for almost everything, except to clean carpets, upholstery and fabric. Results are quite good with brushes. I tried cleaning a Real Techniques brush with a Dettol Multi-Use Wipe after using Benefit Hello Flawless powder and it took off quite a bit of makeup from the brush. I also got some eyeshadow off another brush. Not the whole thing, but enough to keep the brush head bacteria-free until I find the time to do a proper cleansing. I managed to get most of my foundation, Lorac Pro eyeshadows eyeliner, NARS Audacious Anita and Lancome Hypnose Doll Eyes mascara off with just one wipe. There wasn't much residue on my Foreo Luna when I showered. I am really pleased with the makeup-removal results using Dettol Multi-Use Wipes. I didn't have to go rubbing to and fro or treat my skin roughly. The wipes have been comfortable to use, and, as I said before, have helped clear my breakouts. This was a benefit I did not anticipate, so I am all the more pleased for it. These certainly help save time and make my brushes good for another use or two, until I can find the time to clean them thoroughly. I hope Dettol comes out with more fragrances in this range - it is great that they have forayed into products that can be used on the face. I would love to see cologne and lavender wipes. These should be available in most supermarkets, pharmacies and corner stores. If not, try on Amazon. Amazon India sells them here, as also Flipkart and Snapdeal. Dare we hope for antibacterial face washes in the future? Post created in association with Dettol and Indiblogger. All opinions are my own.